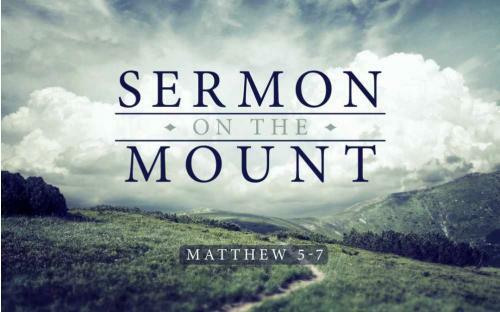 The title, “Sermon on the Mount” does not appear in the text of Matthew Chapters 5-7, but down through the centuries that name has been given to those chapters. Much of the modern teaching in connection with the Sermon on the Mount is misleading. There is a deliberate attempt to substitute the Sermon on The Mount for the preaching of the cross as a means to becoming a Christian. It is just not true! Before we can live out the Sermon on the Mount we must first be born again through the sacrament of baptism. The reason is that in our flesh we can not fulfill the teachings of the sermon on the Mount. We must be buried with Him in baptism and raised in newness of life before we can even start living out the sermon on the mount. We need to first look to Jesus, the Author and Finisher of our faith. It is the preaching of the cross of Christ that seems foolishness to the unbeliever. I Corinthians 1:18 states: For the word of the cross, to them indeed that perish, is foolishness; but to them that are saved, that is, to us, it is the power of God. There is no power to live out the Sermon on the Mount without the cross. The good news that Christ died, was buried, and rose again so that we might be delivered from sin and death is the message that Satan hates. He knows he cannot defeat the message of the shed blood of Jesus at Calvary. His blood was shed for the remission of sin. He is the One who redeems, guides, and who finally will receive us unto Himself. We as Christians live because He lives. To many who are teaching about the Sermon on the Mount are teaching the Ethics of Jesus and never teach about the Shed Blood of the Lamb of God. Man who is by nature a child of wrath, are totally depraved in the flesh and hopelessly lost, They could never make himself pleasing to God. Only “in the Beloved,” that is Jesus Christ, can we be made acceptable to a holy God. Again St. Paul says: Unto the praise of the glory of [Gods] grace, in which He hath graced us in His beloved Son. Jeremiah 17:9: The heart is perverse above all things, and unsearchable, who can know it? Mark 7:21-23: For from within out of the heart of men proceed evil thoughts, adulteries, fornications, murders, Thefts, covetousness, wickedness, deceit, lasciviousness, an evil eye, blasphemy, pride, foolishness. All these evil things come from within, and defile a man. Romans 8:6-8: For the wisdom of the flesh is death; but the wisdom of the spirit is life and peace. Because the wisdom of the flesh is an enemy to God; for it is not subject to the law of God, neither can it be. And they who are in the flesh, cannot please God. Romans 3:13-18 presents the sordid picture of the unregenerated man, a man who lives in the lust of their flesh, fulfilling the desires of the flesh and of the thoughts: Its says, "Their throat is an open sepulchre; with their tongues they have dealt deceitfully. The venom of asps is under their lips. Whose mouth is full of cursing and bitterness: Their feet swift to shed blood: Destruction and misery in their ways: And the way of peace they have not known: There is no fear of God before their eyes." Understand that from the top of his head to the soles of his feet the unregenerate man is rotten, spiritually speaking. The god of this age has blinded the eyes of the his understanding and he cannot see himself as he really is- lost, without hope, and without God. He cannot make himself acceptable to God, and until he recognizes that, he will not cry out to God for redemption. Man cannot fulfill the Sermon on the Mount on his own. He cannot make himself meek simply by trying. He cannot make himself merciful simply by trying to show mercy, and he certainly cannot purify his own heart! Not until he or she has been buried with Christ in baptism and raised in newness of life. And not until he or she has a heart that says “not my will but thine be done” will the graces of baptism fully work in your life to do what Jesus teaches in the Sermon on the Mount. For those who are unbelievers the Sermon on the Mount speaks condemnation for no one who is of this world are able to fulfill the commandments given in this sermon. But to those who are children of the Kingdom of God it is the manifesto of the King. And because of the graces that work through us, we are able to live out What Jesus our King desires of us.